I enjoyed a muddy toes morning in the garden. Time stood still as I watered my plants. I chatted with neighbors and pedestrians as I worked in My Victory Garden. I even handed out a few onions. 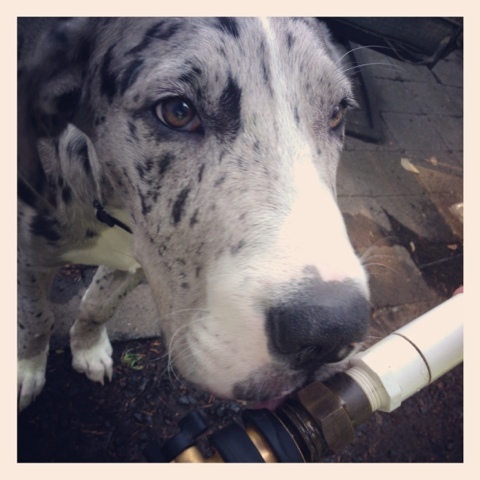 And then when I moved into the backyard, Barnaby noticed the water wand for the first time. He started licking up the water that trickled down the side of the water wand. And then he chased the billowing stream of water while I laughed. He even stuck his head in the water, pulled back in surprise, and a hummingbird launched between us and under the water wand handle towards the hardy fuchsias. I even tried to take a few (bad) pictures of him on my phone. Barnaby taking a sip of water. When I placed the water at the base of a tree on a slow trickle, he swiped his paw at the ground and snorkeled (blew bubbles) in the muddy water that gathered in the hole. Then we both sat on the patio furniture and dried off in the sun. And The Assistant joined us once the water was safely turned off. Barnaby might just be a water dog.